Jewish-German refugee Henry Wuga escaped Nazi Germany at 15 years old, but was arrested and falsely accused of espionage. The little-known history of Warth Mills WWII internment camp in Bury, Greater Manchester, is set to be revealed next week (June 2018) with the launch of a commemorative events programme and website. 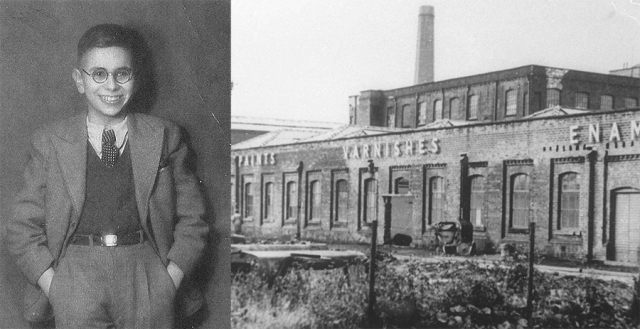 The HLF-funded Warth Mills Project will tell the story of Warth Mills and its internees, which included Italians who had resided in Britain for decades and German Jews who had fled Nazi death camps. Originally a major cotton mill, Warth Mills became an internment camp in 1940. As Northern Europe fell under Nazi control, Churchill instructed authorities to intern all Italians, Germans and Austrians resident in Britain. These 'enemy aliens' included Italian chefs and café owners, Jewish artists and academics who were fleeing persecution – most of whom posed no threat to British security, and some went on to fight with the allied forces. “When war broke out in early 1939, my parents... found me a place on Kindertransport for evacuation… there were around 100 children being evacuated. I didn’t have any siblings so I went on my own and didn’t know anyone but, having worked away for six months at 14, I felt like I could handle it”. Henry was matched with a lady guarantor in Glasgow, and was lucky to find a warm and welcoming home. But then in 1940, aged just 16, Henry was arrested for “corresponding with the enemy”. His crime had been to attempt to send a letter to inform his parents of his wellbeing, via his uncles in Paris and Brussels. Henry was declared a Category A alien and given one hour to pack before his internment journey began. After being held at temporary holding centres in Glasgow, Edinburgh and York, Henry was sent to Warth Mills. The camp was already far exceeding its capacity and conditions were lamentable. Henry describes it as “a crazy, horrible place. Extremely dangerous and primitive”. Henry underwent several tribunals, eventually being released in 1941. He returned to Glasgow to work again in the restaurant and hotel trade. In 1960 he and his wife Ingrid started a kosher function catering business. Henry and Ingrid have now been married for 73 years and have two daughters and four grandsons. The Warth Mills Project is led by Unity House, based at The Met in Bury, and successfully bid for £64,500 from the Heritage Lottery Fund (HLF). The project started in 2017 when volunteer researchers began creating a digital archive. Partners include St Modwen, The Met, Manchester Jewish Museum, Bury Art Museum, Bury College, Archives+, International Anthony Burgess Foundation, Bury Council, Imperial War Museum, Manchester Art Gallery, Mill Gate Shopping Centre, Refugee Week, The Fusilier Museum, World Jewish Relief, Bury College, Workers’ Educational Association and University of the Third Age. The Warth Mills Summer 2018 events programme includes an art showcase by students at Bury College, music recitals and events honouring internees.